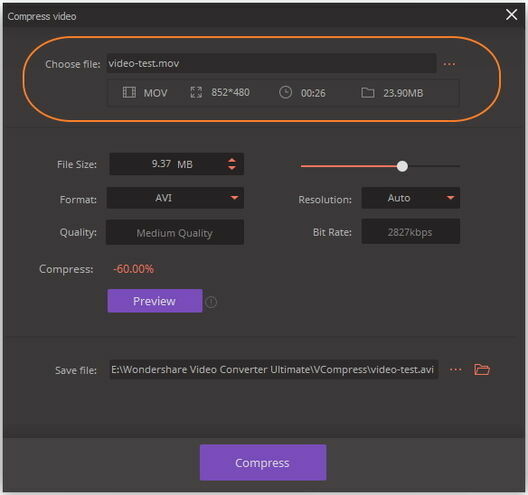 Wondershare video compression tool allows you to compress video size with one-click and real-time preview. 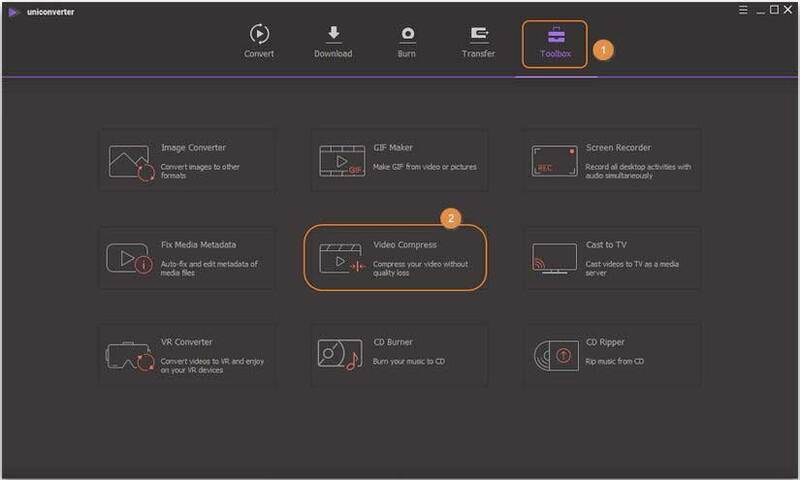 You can intuitively customize video resolution, file size, video quality, video format, output path, and other features with this tool. 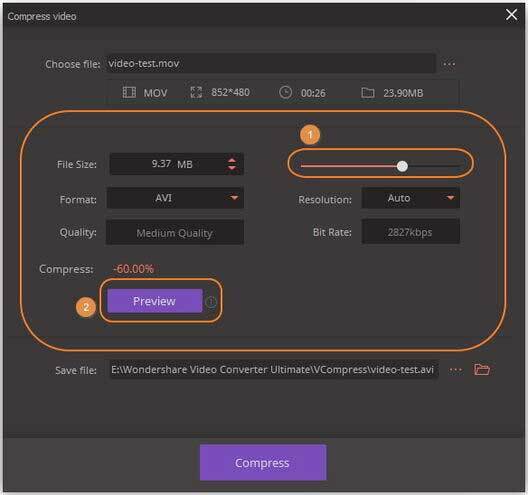 Follow the step-by-step guide below to compress video files using Wondershare UniConverter (originally Wondershare Video Converter Ultimate). Tips: You're allowed to change the video format to MP4, AVI, MOV, MPEG before compressing. If you want to convert and compress videos to more formats or convert in batch, just move to the Convert Videos with Size Compressed part to learn other simple methods. Launch Wondershare UniConverter (originally Wondershare Video Converter Ultimate) after installation, then click the Toolbox tab and choose Video Compress option. You’ll get a new window to add videos. Click the " + " icon on the screen to open the file browser and select your desired video, you can just add one video at a time. A Compress video window will appear after you have added your video successfully. The information of your added video is displayed in the first section, which including video formats, video size, video resolution, and video length. You are allowed to change the video by clicking the ... icon. In the second section, you can see several compression settings listed here. Move the progress bar to compress video size quickly. Click the Preview button to preview the compressed video quality for 20 seconds. File Size: Shows the output video file size. Click the button to adjust the video size. It will be changed automatically when you're moving the progress bar. Format: Click the button to open the video formats list and select a target video format. MP4, MOV, AVI, WMV, and other common video formats are provided here. Quality: It will remind you the output video quality as Low Quality, Medium Quality, and High Quality, it's up to your compressed video size. Resolution: Choose your video resolution as Auto, 240*160, 320*240, 480*320, 640*480, 720*480, etc. Bit Rate: It shows the video bit rate according to your compressed video size. 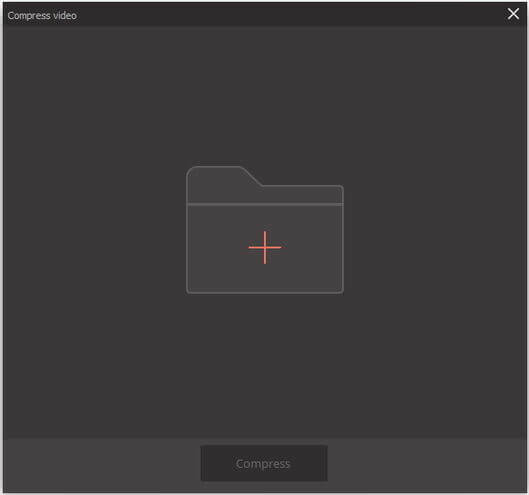 Compress: The percentage of how much you have already reduced your video size. Click the ... icon to choose the file location for your video, and you can find it directly by clicking the icon. 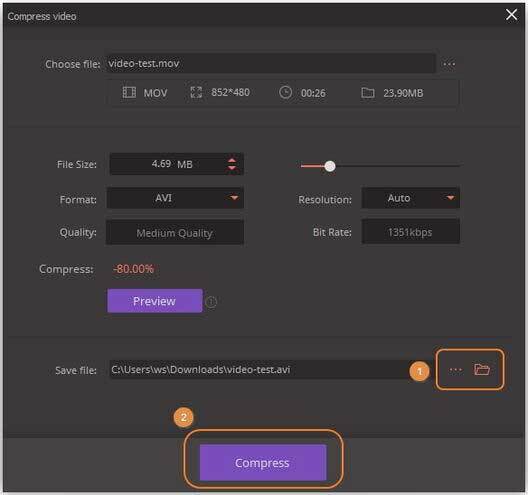 Finally, click the Compress button to start compressing your video size. You'll get a reminder of Compress successfully after the compression progress completed.